Was the existing version of Total War: Rome II fit for a king? Creative Assembly didn’t think so, so they’re bringing out an Emperor Edition sometime in September. That’ll collect together all the free updates Rome has had to date – which isn’t particularly remarkable for anybody with broadband and a spare day to leave Steam whirring. But it’ll also herald a brand new expansion campaign that’ll last players “hundreds of hours”. Called ‘Imperator Augustus’, it’ll come to all Rome II owners for free. The new campaign is played out across a new map, based on geopolitical lines drawn during the Second Triumvirate War. That conflict saw Romans fighting Romans – specifically Octavian, Marc Antony and Lepidus – to become Rome’s first emperor. This time, that’ll be you, obvs. “We wanted to recreate the vast civil war which erupted after Julius Caesar’s murder,” explained lead designer Jack Lusted. “You can tackle the campaign as various Roman and non-Roman factions, including Armenia for the first time. It is! 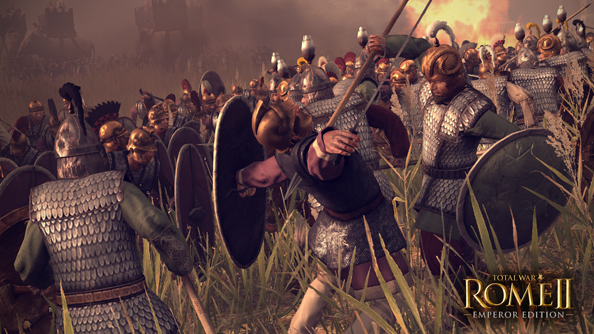 While Rome II’s launch was CA’s messiest since Empire, they’ve seen players stick with it for longer stretches than any other Total War in the series. CA have rewarded their faith with dedicated post-release patching and the promise of Total War: Rome II on SteamOS. Do you think it will be, belatedly?